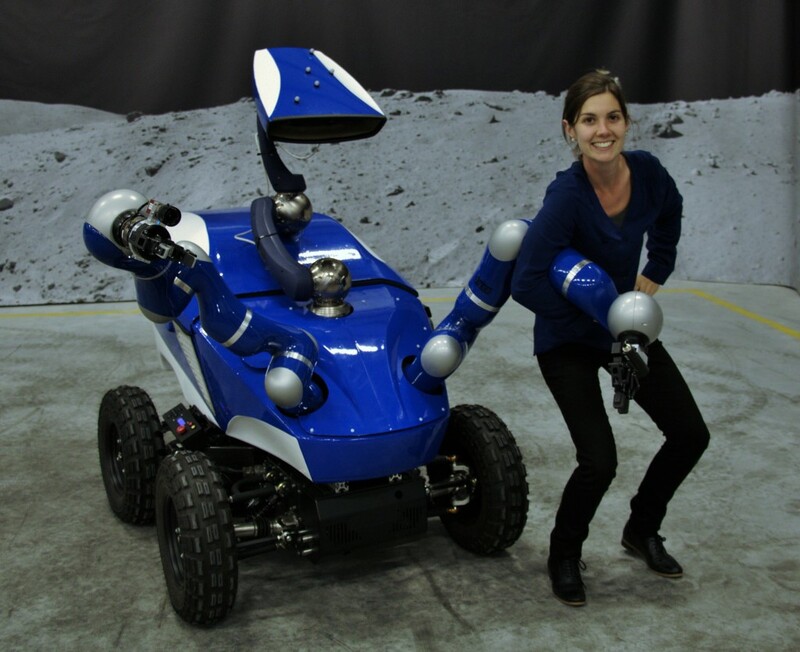 Eloise with ESA’s INTERACT robot, operated by astronauts on-board the International Space Station (ISS). The Telerobotics and Haptics team aims to validate advanced robotic control developed for future exploration programmes. 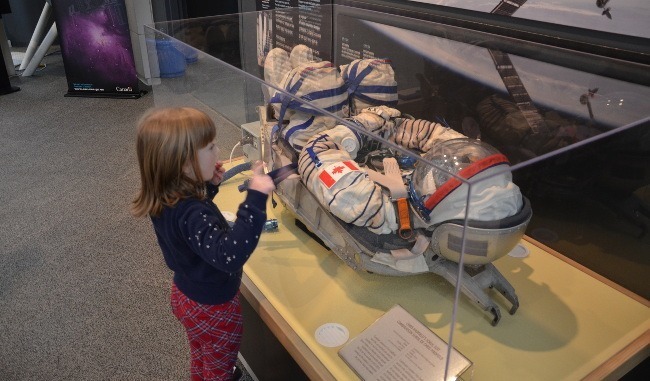 Eloise Matheson can’t remember a time when she wasn’t interested in space. 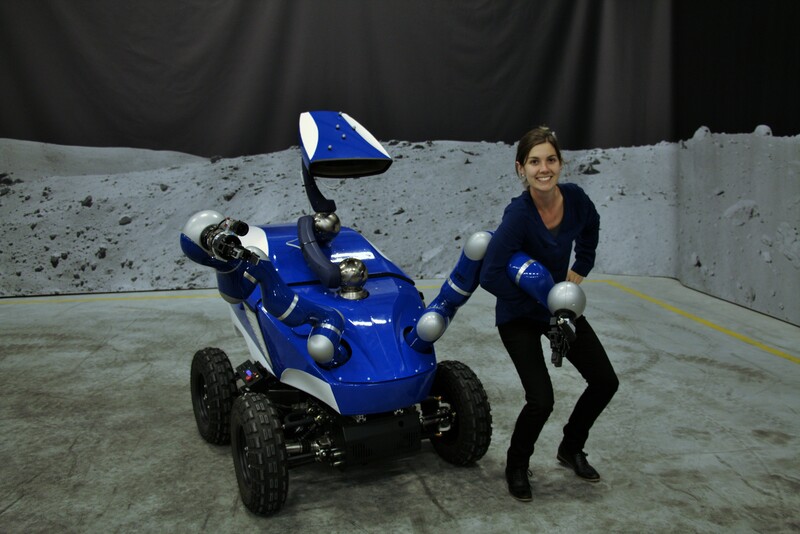 Her passion has culminated in her being based at the European Space Agency (ESA) as a Telerobotic Engineer! She recently shared her story with Rocket Women. I started working at ESA as a British Young Graduate Trainee in September 2014. This program is aimed at providing experience to recent graduates, allowing them to gain an understanding of the European and international space arena. I was placed in the Telerobotics and Haptics Lab at ESA under the Mechatronics and Automation Section. It’s a really wonderful lab of around 10 dedicated and passionate people. When my traineeship finished a year later, I was lucky to stay on as a contractor which is how I am here today. 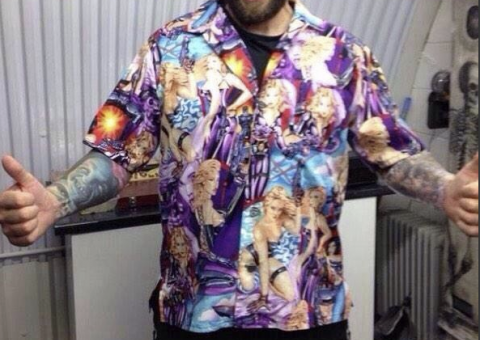 Working at ESA was always a goal of mine. Having previous industrial experience and a strong academic record helped to achieve this. By education I’m a Mechatronics Engineer. I completed a combined Bachelor’s degree in Mechatronic (Space) Engineering/Bachelor of Science at the University of Sydney, Australia in 2010. After 18 months of working and travelling, I started a 2 years European Master of Advanced Robotics (EMARO), an Erasmus Mundus program, which finished in 2014. In this program I studied for one year at Warsaw University of Technology, Poland, and my final year at Ecole Centrale de Nantes, France. It was a fantastic program where I learnt not only technical skills, but also had the unique opportunity to experience different cultures and make friends from all around the world. My favourite thing about my job is how dynamic it is. Since the time I’ve started there, we have been involved in three different space experiments. My favourite thing about my job is how dynamic it is. Since the time I’ve started there, we have been involved in three different space experiments under the international METERON project. METERON aims to test telerobotic technology through a series of experiments from the ISS to robotic labs across the world. For us, the latest of these was INTERACT, an experiment where the Danish astronaut Andreas Mogenson controlled our rover on the ground from the ISS to localise and find a taskboard, before driving there and performing a peg-in-hole task with force feedback. It sounds easy to put a peg in a hole, but it is much harder when you are hundreds of kilometers away, controlling a robotic manipulator over a communications link with a nominal delay of 800ms and the peg tolerance to the hole is measured in micrometers! The experiment was a success, and proved that our control strategies, visual interfaces, haptic feedback and master and slave devices were able to complete useful tasks over a space-to-ground link. It was a very exciting, challenging and rewarding project for us. What I physically do each day changes – ranging from mechanical integration of parts, to testing of electrical circuits, to coding for embedded systems and documenting manuals and other procedures. I can’t remember a time when I wasn’t interested in space. My sister would say that someone once told me as a kid that I couldn’t be an astronaut, so from that moment on it was decided in my mind what I would be. I can’t remember a time when I wasn’t interested in space. My sister would say that someone once told me as a kid that I couldn’t be an astronaut, so from that moment on it was decided in my mind what I would be. The notion of exploring what is beyond our world, of discovering where humanity came from and furthering the boundaries of known knowledge is, I believe, an entrenched human trait that everyone shares. Working in space helps us to achieve this one little bit at a time. To be honest, I’m not sure I had initial expectations of what my career journey would be, except that I knew I wanted to work in space. I’m always planning what could happen in the future, but really, the future is impossible to plan in such detail! In hindsight, the steps that pushed me to be on the path I am now were all fortuitous. Of course it took, and continues to take, a lot of hard work, but I truly believe it’s important to be open to opportunities and make the best of every situation as it comes your way. Perhaps my only expectation is to one day experience what it is to look at the Earth from the outside of it…I fully expect this to be a difficult, but incredibly rewarding, path. As a young girl I never considered that any particular job was more for men than it was for women, however it was clear that some industries like STEM were more male dominated than others. This was a challenge to change the industry, not a reason to avoid it. I think role models, of either gender, are very important to young girls, so that they can see the myriad of options that exist from working in STEM. As a young girl I never considered that any particular job was more for men than it was for women, however it was clear that some industries like STEM were more male dominated than others. This was a challenge to change the industry, not a reason to avoid it. One of my role models was Nancy Bird Walton, a pioneering female aviator in Australia who I had the fortunate chance of meeting on multiple occasions. She encouraged me to fly, to follow my dreams, to explore and most of all to never lose a strong sense of curiosity about the world. Just as inspirational was my undergraduate thesis supervisor – he said that if the motivation for a choice was to continue learning about the world, then it was the right choice. Of course having opportunities to meet and interact with women and men working in STEM that are supportive and encouraging of girls working in STEM is vital. One of my role models was Nancy Bird Walton, a pioneering female aviator in Australia who I had the fortunate chance of meeting on multiple occasions. She encouraged me to fly, to follow my dreams, to explore and most of all to never lose a strong sense of curiosity about the world. When I was 10, I think my main goals in life were to be an astronaut OR a parking police officer OR a dermatologist – to me these were all incredibly exciting jobs. As I grew older I found I was good at maths and science, but I equally enjoyed English and music. After high school, I wanted to study science – believing it to be a good path to astronaut-hood, and falling into engineering happened almost by a lucky mistake (it’s a long story involving a potential move to a new city, a high school romance and last minute choices). My advice to my 10 year old self, or any 10 year old, is to listen to your instincts about your choices and know that your interests and dreams will change and that’s ok. It’s also ok to not know what you want to do…but if you don’t know, studying engineering is an awesome option as it probably gives you more choices for career paths after finishing than any other degree. Don’t think you can’t succeed on a certain career path simply because you don’t tick all the boxes at that point. I failed my first programming course in C at university – I had never coded before at high school. In hindsight I would have changed when I started seeing computers as a tool rather than a box playing music and accessing the internet, but at that time of my life I didn’t know what coding was. Now I see it as a language, and a fairly universal one at that. I finished high school in 2005 – I think there is a huge difference between the online learning facilities that exist for children now compared to then, as well as a shift in educational curriculums putting more emphasis on technical skills. Would I have done things differently? I don’t think so. I’m very happy where I am now. I’m excited what the future holds. Probably the advice my 10 year old self would tell me today is not give up dreaming, not give up on optimism and maintain the strong belief that everything is possible with enough motivation and drive. Rocket Women is honoured to be featured by Ireland’s biggest science and technology news website, Silicon Republic. The article is part of their ‘Women Invent’ series, which highlights and profiles women in STEM, aiming to encourage young women to be more aware of STEM and pursue careers in it. The sky is no limit for space consultant Vinita Marwaha Madill, who is keen for young women interested in STEM to have role models. ‘In space, no-one can hear your bones weaken, but some exercise and a specially-designed spacesuit can help – and this is where space engineering consultant Vinita Marwaha Madill comes in. “Astronauts carrying out six-month missions on the International Space Station [ISS], including Tim Peake, can grow up to 5cm to 7cm in height, with the spinal growth causing tension in the vertebrae and back pain,” explains Marwaha, adding that, in microgravity, humans can lose 1-2pc of their bone mass per month and their muscles can waste. Exercise can help protect against these changes, but what else can be done? Marwaha has been involved in designing a ‘gravity-loading countermeasure skinsuit’ with the European Space Agency to mimic the effects of gravity on the body and help prevent elongation of the spine. The suit, which draws on several years of research and development, was evaluated last year onboard the ISS by Danish ESA astronaut Andreas Mogensen. 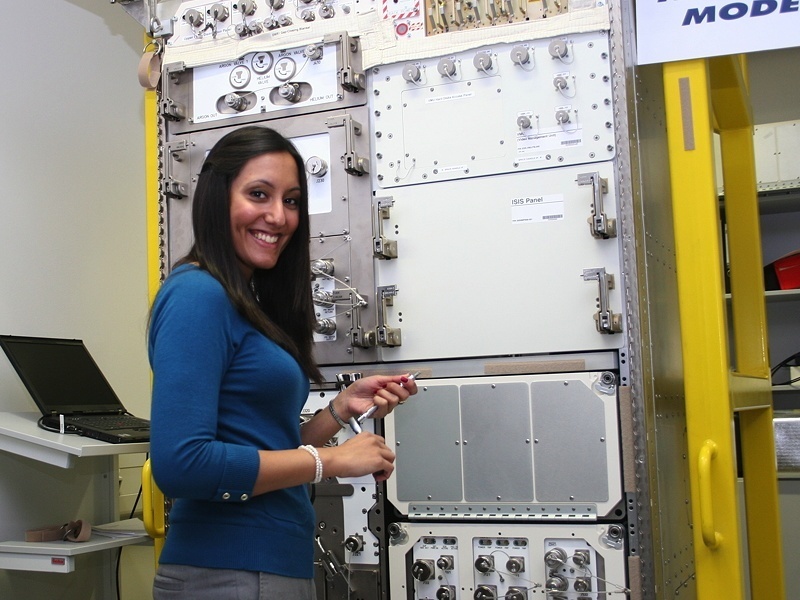 Marwaha Madill has also helped astronauts to get to grips with spacewalk (EVA) skills at the European Space Agency’s European Astronaut Centre (EAC) in Cologne, Germany. Currently based in the UK and Canada, Marwaha has worked too on ISS operations at the German Aerospace Centre (DLR), guiding and training astronauts through experiments on the Station as it orbits Earth. Marwaha credits role models such as astronauts Helen Sharman and Sally Ride for inspiring her to work in the space sector. Aged 12, Marwaha went to the library and printed the astronaut candidate guidelines (you can see a contemporary version here) from NASA’s website, then stuck them to the inside cover of her school folder. She recalls them as being a daily reminder of how to reach her goal and set her focus on achieving them. “Those guidelines set the direction for my career,” she says. Today, as well as working as a consultant focusing on space engineering, Marwaha is heavily involved in STEM Outreach through talks and through her website Rocket Women, for which she interviews women in STEM and space around the world. “Only 6pc of the UK engineering workforce are female, meaning that UK companies are missing out on almost 50pc of their engineering talent. This is coupled with the fact that girls make up under 20pc of students taking physics A-level,” she says. With 2015 almost over, it’s time to look back at the inspiring women that took a leap and broke records this year worldwide. 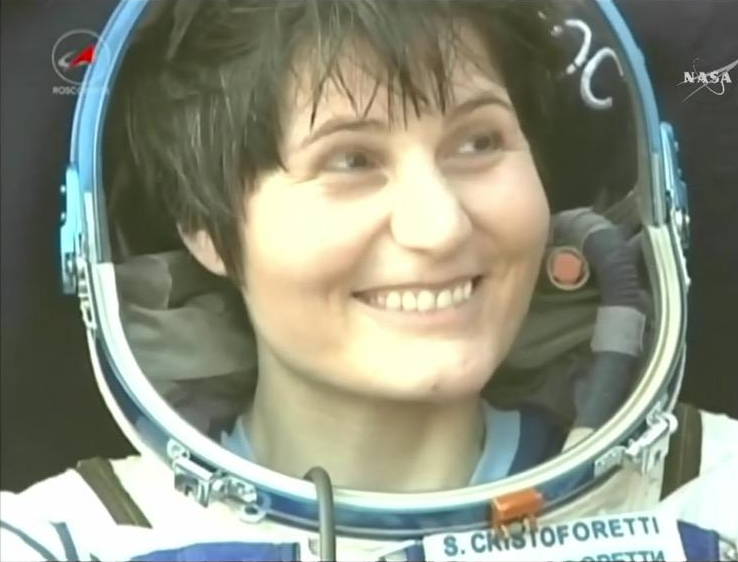 When European Space Agency (ESA) Astronaut Samantha Cristoforetti landed in her Soyuz descent module on a desert steppe in Kazakhstan on 11th June 2015, she did so breaking the world record for the longest serving female astronaut in space. Samantha spent 200 days on the International Space Station, beating the previous record of 195 days held by NASA astronaut Sunita Williams (Sunita herself is on track this year to become the first female NASA astronaut to fly to space on a commercial vehicle). On her launch day to the ISS, 200 days earlier, Samantha became the first Italian woman in space. Her mission, along with that of crewmates NASA astronaut Terry Virts and Russian commander Anton Shkaplerov, was extended from an original May end-date, due to an incident with the Russian Progress 59 resupply mission. 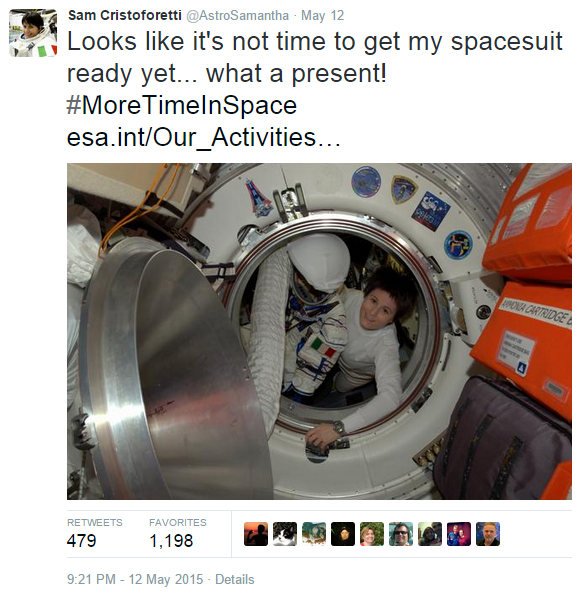 Samantha wasn’t at all disappointed by the delay tweeting, “Looks like it’s not time to get my spacesuit ready yet… what a present! 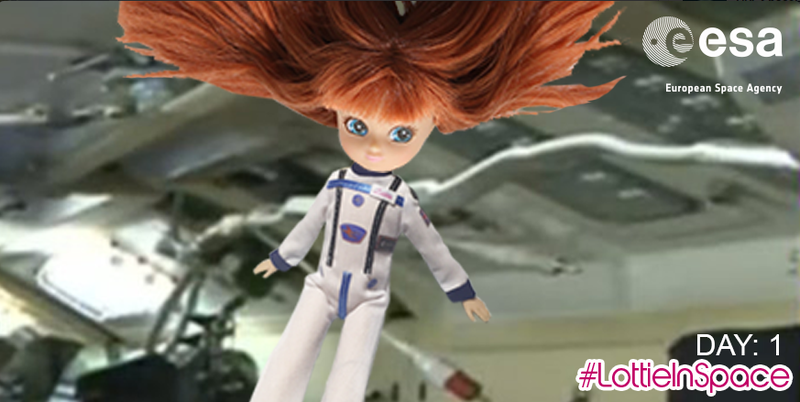 ‪#MoreTimeInSpace.” Whilst on the ISS she spoke to Hollywood actress Susan Sarandon, thanking Susan for her interest in girls in STEM and commitment to help girls find their way to Science, Technology, Engineering and Math[s], “..maybe in the future we can event work together to help sparkle that passion and interest for STEM and to show that no dream is too big”. She’s an inspiration for women worldwide dreaming of becoming a Formula One (F1) driver. Susie Wolff, Williams F1 Test Driver, announced her retirement from the sport at the end of 2015. At the 2014 British Grand Prix Susie became the first woman to participate in a Formula One weekend since 1992 as a Test Driver. That’s 22 years without a woman on the Formula One track, let alone as a F1 driver. The last woman driver to actually qualify for a Formula One Grand Prix race was Italian Lella Lombardi who competed in three seasons, from 1974 to 1976. only scoring points in 1975 and finishing sixth. 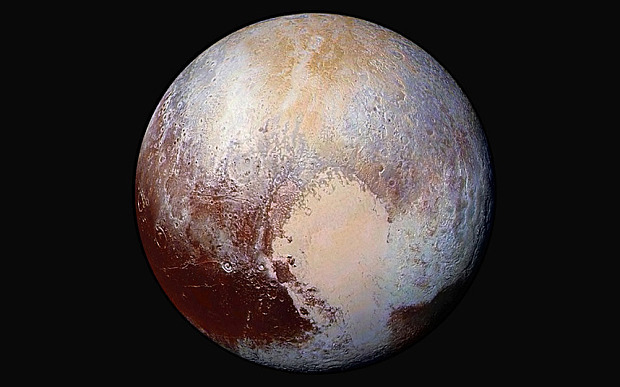 On July 14 2015 at 7:49 am EDT we saw Pluto, a dwarf planet, up-close for the first time. Behind this historic achievement however is a team of brilliant, hard-working women in charge of the $700 million piano-sized NASA New Horizons spacecraft. New Horizon’s historic moment took travelling through the Solar System for over 9 years, before allowing the world to learn about this icy dwarf planet during it’s 30,800 miles per hour (49,600 kilometers per hour) flyby. The story that most people have not heard of though is of the mission team, with the flight team comprised by 25% women, potentially making it the NASA mission with highest number of women staffers, including many scientists and engineers. These women have dedicated their careers and years of their lives to this mission, to gain unique data from the seven instruments aboard New Horizons and gain an unprecedented insight into Pluto and it’s largest moon, Charon, in particular, found to have a landscape covered with mountains, canyons and landslides. 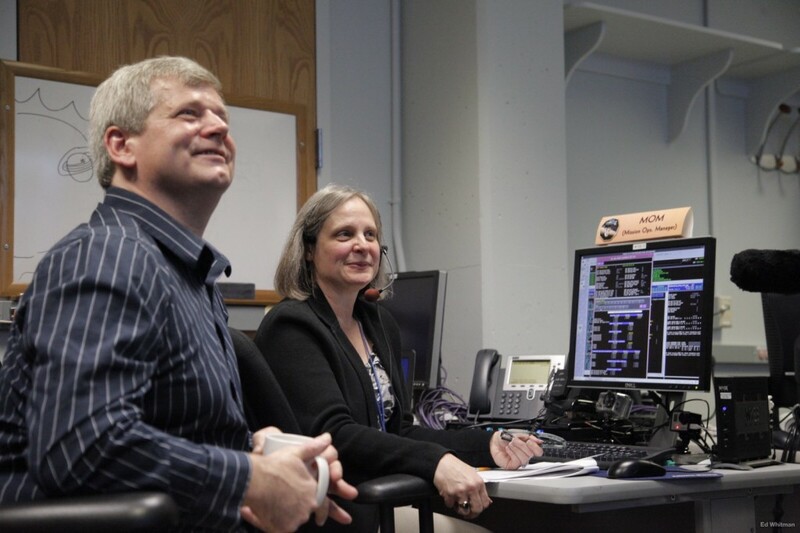 Relatedly, Alice Bowman, New Horizons Mission Operations Manager (MOM) and group supervisor of the Space Department’s Space Mission Operations Group, made history as the first female Mission Operations Manager (MOM) at Johns Hopkins Applied Physics Laboratory (APL). The novel scientific discoveries gained by the instruments aboard NASA’s New Horizons spacecraft were only made possible with the dedication of the women behind the mission. The Stargazer Lottie doll is available now worldwide and would make a fantastic Christmas gift for any young budding astronomers! Wednesday 12th November, 2014: The date history was made. An achievement solely made possible through the efforts and countless hours of work by scientists & engineers at DLR (German Aerospace Centre), CNES (Centre national d’études spatiales – French Space Agency), ESA (European Space Agency) and through partnerships with companies and space agencies globally. The mission has been ongoing for over a decade, since it’s launch on 2nd March 2004. Travelling over 6.4 billion kilometres (4 billion miles) to reach it’s destination, Comet 67P/Churyumov-Gerasimenko, the Philae lander separated from the Rosetta spacecraft and seven (nail-biting) hours later soft-landed on the surface of the comet. It in fact landed a total of 3 times, bouncing twice, initially 1km off the comet before finally coming to rest (landing at 15:33, 17:26 & 17:33 UTC.). 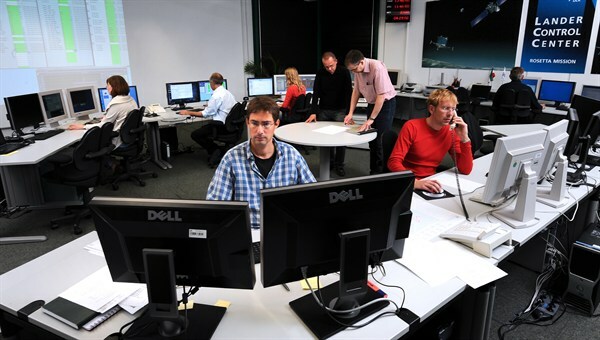 I was lucky enough to work at DLR MUSC (Microgravity User Support Centre) with the fantastic Philae Lander team whilst operating payloads on the ISS (International Space Station). Landing Philae, a spacecraft the size of a household fridge, on a 3-mile-long comet travelling at 80,000 miles per hour is no easy task. 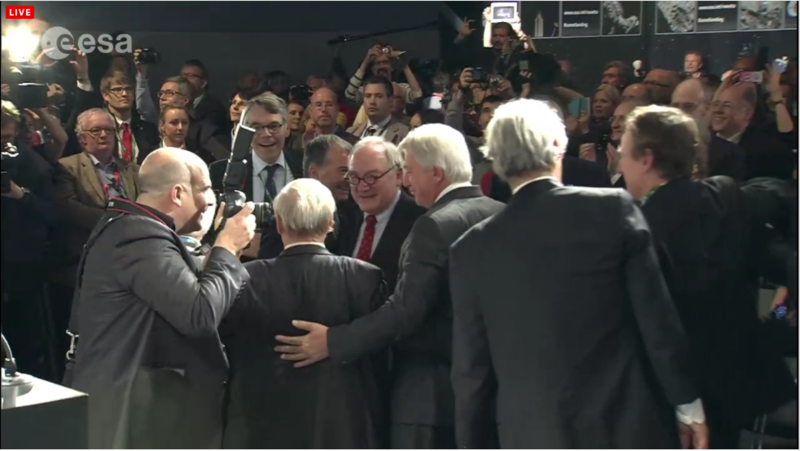 Arduous work that ESA’s Director General Jean-Jacques Dordain mentioned in his congratulatory speech as success made look easy. Due to their work we’re lucky to have a multitude of scientific discoveries to come. Comet 67P is over 4 billion years old, older than the Earth itself. Through the Rosetta mission we will hopefully discover whether comets are responsible for bringing life to Earth, through the prebiotic molecules and water, along with gaining a deeper insight into the origins of our solar system, our own home. After landing, telemetry showed that Philae had actually sunk four centimeters into the surface of the comet, indicating a partially-soft surface. 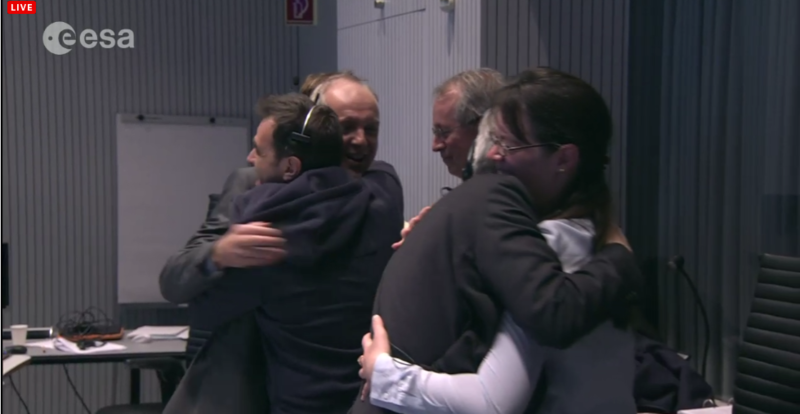 The photos below show the sheer emotion of the entire Rosetta/Philae team when learning that Philae had touched down on the surface of 67P. As said after the successful landing, ‘We hope that the Rosetta mission will inspire the next generation to go to space, just as Apollo has done for us.” It indeed looks as though the Rosetta mission has caught the world’s imagination, with the top 3 trending topics on Twitter in London, UK yesterday being #CometLanding, #Rosetta and #Philae. With #CometLanding or Comet being mentioned in 479,434 tweets! Here’s hoping that the young people watching the Rosetta mission are inspired to study STEM (Science, Technology, Engineering, Mathematics) and create their own extraordinary achievement in the years to come. 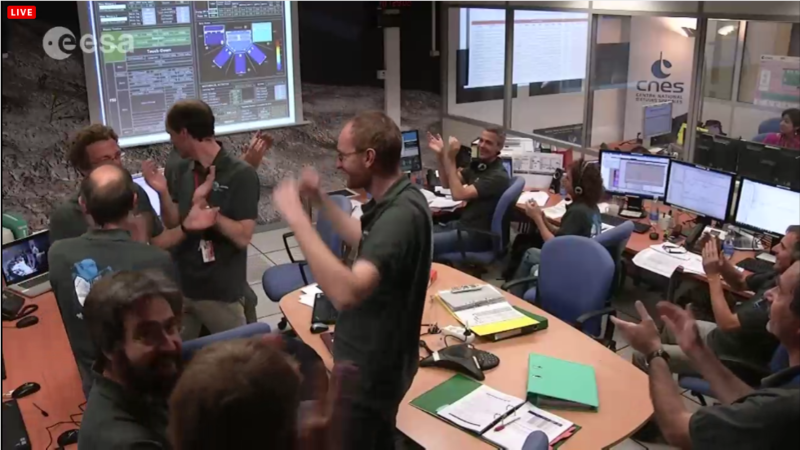 Rosetta Mission Managers & Operations Directors Celebrating! 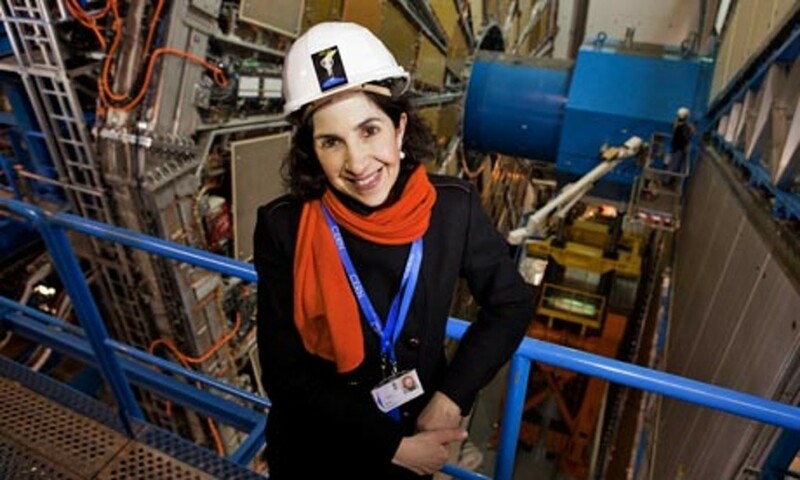 I wanted to say that this choice of attire isn’t the norm of scientists and operations engineers in the space industry or in a STEM career, especially considering the scientist was on a LIVE on-air broadcast. 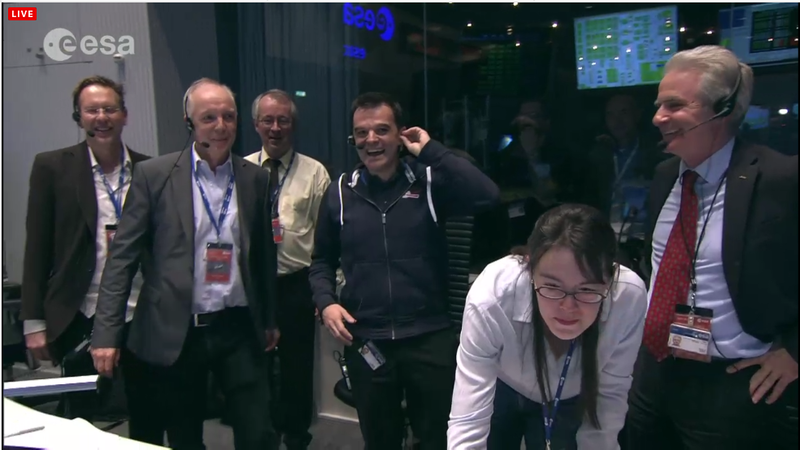 With formal attire worn at NASA’s Mission Control for on-camera personnel and those on-console, Europe’s (mission polo-heavy) control centres are certainly not a place where the offending shirt would be welcome. I’ve certainly never seen anything like this during my time on-console carrying out ISS payload operations or whilst working at any of ESA or DLR’s centres. I strongly hope this doesn’t dissuade anyone from following a career into space operations, or takes away from the astonishing scientific achievement conducted by the team. Spacecraft operations is an extremely rewarding career, as I’ll talk about in my next post!